Note: If you are looking for the ability to use the FTDI directly with your Bluetooth Mate check out our Crossover Breakout for FTDI! **Note: **The hardware reset pin of the RN-41 module is broken out on the bottom side of the board. This pin is mislabeled as 'PIO6', it is actually PIO4. Should you need to reset the Mate, pull this pin high upon power-up, and then toggle it 3 times. It works great with Windows and Mac. but there is big problem with Linux(Ubuntu 16.04) no proper documentation. It connects only for some seconds and then disconnect automatically. Is there a reason that these are still so expensive? 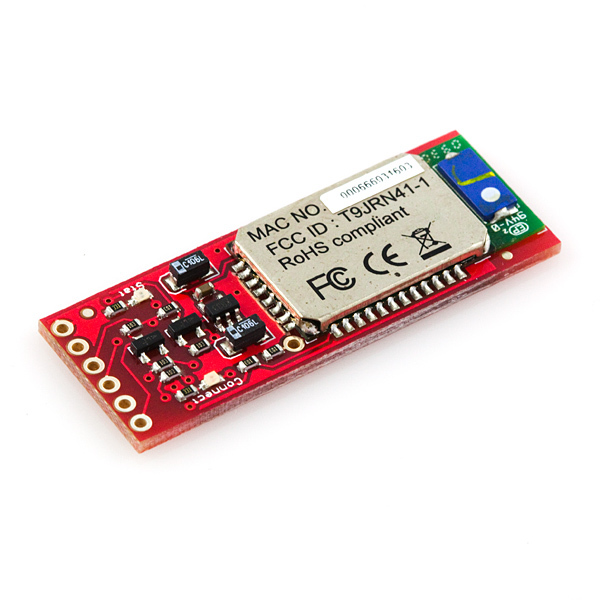 The bluetooth module itself is around $25, and that's in low quantities. In order to connect this to Arduino pro, I tried to follow this link: http://www.rioleo.org/setting-up-the-arduino-pro-mini-and-bluetooth-mate-on-mac.php But I cannot find out "edit serial ports" in the bluetooth preference of my mac (my OS X version is 10.9 - Mavericks). When I pair it, it shows "connected" (but doesn't change the led on bluetooth mate as green - stays on red) but automatically disconnect it again in 1-2 mins. Can any one give me the answer how to figure it out? Hey, I have the same problem as you did. How had you solved it? Did you ever got this resolved? previous version of this device Replaces:WRL-9358 working great, this new version WRL-12580 is not working normal, after 1st connection it's not working for second time. this device not working normaly, after one connect it does not connect again second time. I'm having some trouble getting the bluetooth inquiry. When querying one of these from another I often find myself missing the name of the device. Anyone know why? I have a very old BlueSmirf gold the one that was being sold year 2006. It used to work with my laptop with windows XP, I know those were replaced by this new model. 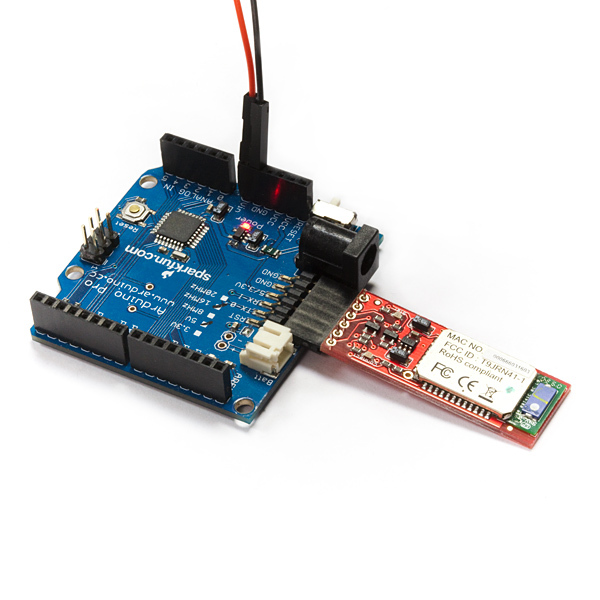 My question is to sparkfun engineers or any who had encountered this problems, can you use the old bluesmirf with newer operating system like windows 8.1 or are there incompatibilities with Bluetooth stack and old bluesmirf firmware? Do you have to use this new model? Why does the Bluetooth Mate show up on my Mac as a bluetooth device, but it does not show up on my iPad Mini? Its just a guess, but its very possible the iPad Mini is Bluetooth 4.0 only and not backwards compatible. As far as I can tell, the only difference between this and my old WRL-9358 is the firmware. Is there any way for me to upgrade it myself to get the HID profile? The datasheet mentions firmware upgrades over SPI, but I can't seem to find any relevant downloads/instructions. Unfortunately, there is no way to update the firmware on the Bluetooths. These come from as is from the manufacturer MicroChip. There was nothing from the manufacturer's site that indicates that the bluetooth firmware can be upgraded due once it is out in the field. Hello! I have followed the Hookup Guide an can communicate between a Arduino UNO and the bluetooth mate gold. I am able to see the settings and and probe for surrounding BT devices, I can also detect the Mate Gold on my computer, but I am unable to connect with the deivce! I have tried two different PC's and a Android Phone without any luck. Hey guys i had the older Version WRL.9358 which works fine but i have problems with the new version. On the old Version i could just use the Password 1234 and it worked. But in the new Version when i Connect Windows is giving me a Code and i dont must enter a Password and then when i Click no or yes the Bluetooth is added but it just not connects. Can anyone Help how must i connect de the Bluetooth Mate Gold? Is ther no password anymore? And why are Windows giving by every time a new Code? The code may just be different on this version. By default it should be 0000, give that a try. Hello all; I am experiencing an interesting issueâ¦I am not able to figure out whether this due to my code or a hardware problem. I was hoping to gauge you all to see if anyone has experienced this. Although the documentation states that such a state is NOT possible, I have experienced it. I have purchased over 20 of these for a project and I have experienced this with 3 of them (although I have not tested each one extensively). ISSUE: The module is connected (green led - solid) and then all of a sudden I get the following: BOTH the RED led (fast blink) and GREEN (solid) led are lit up at the same time. This suggests the module is both in command mode and connected at the same time. The documentation states such a state is not possible. Hi guys, working with these units now- I've seen this. It happens when you have a connection and your AT commands put the Bluetooth unit into CMD mode while the connection has not yet been terminated using the k,1 AT command. If you send to a PC, how is the data received? Specifically, can it be configured to be received by a virtual COM port, or must the receiving software gather the data from the Bluetooth device? 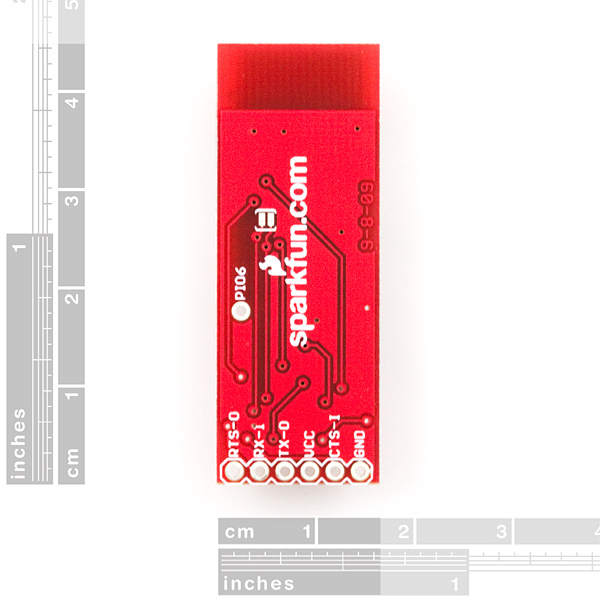 Perhaps in the next design iteration add pads on the back for the 6 pin SMD female header that FTDI Basics use? There's plenty of real estate and it would be nice to not have the connector overhang the board. Can this device work with LilyPad MP3? Can this be adapted for Arduino Mega or other boards? WRL-12579 has a similar price increase relative to the module. Solid and reliable piece of kit. Just made another bulk order. Value for money. RX and TX were reversed but otherwise, it works great! I spent a week racking my brain! Finally, out of the blue, I tried reversing TX and RX and it worked! 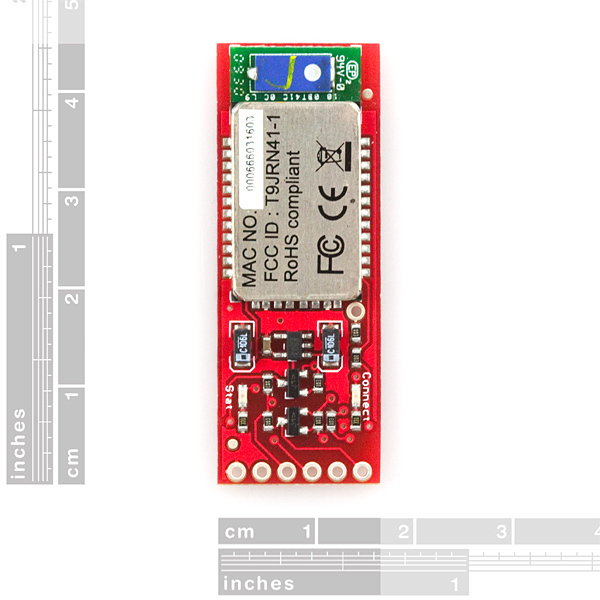 This is interchangeable with an FTDI adapter and an OPENLOG. All my projects have a 6-pin FTDI connector to which my software prints debug messages at 115200 bps. I start with an FTDI adapter when it's on the bench, and then use an OPENLOG when it's mobile. NOW I can use this for mobile testing and save constantly pulling out the OPENLOG SD card! When I've finished initial debugging, I'll put the OPENLOG in, just in case. Very Handy!